Meet the Trollkin... And Drive Them Into the Sea! The trollkin and their shaman have come to a village by the sea, stormed its walls, and taken all the villagers as slaves and property. They have eaten their way through the saltfish, devoured the herd of sheep, and might be planning to eat the PCs next. Then, one escaped villager begs strangers on the road for help... And gives them the chance to shine as true heroes striking down raiders of pure evil. 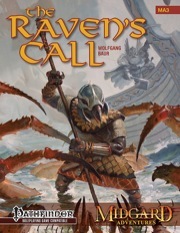 "The Raven's Call" is an introductory adventure that brings mythic power and a true rescue story for starting 1st-level characters in the Pathfinder Roleplaying Game, and introduces locales and NPCs that players will never forget. It offers new monsters and new magic in the unique style of Wolfgang Baur, one of the leading roleplaying game adventure designers. Really anxious to see what people think of this! sounds like a intresting story/adventure. It was written to be structurally similar to something like Hommlet, where there are multiple ways to resolve things. Here's a preview of the art by Mike Perry, as he worked and reworked the iconic Trollkin image. Interesting article and a really nice view of the awesome final trollkin illustration! Hey, thanks for the review, James! This will be the one to open up my Midgard campaign. I was going to start in Margreve but that will come later me thinks. Hmmmm. Tell me more about the requirements for a VTT map. Because we could totally do that as a map pack, if I knew the specs. Is it a particular file format, certain scale, or something else? Well, high enough resolution on battlemaps that they were not fuzzy when blown up large enough for tokens. Naturally, scaled to 1" = 5'. Most VTT's leave you able to enlarge and lay their grid over yours. I know roll20 does this. Other, say overland, maps don't need grids...just high enough resolution. AdventureaWeek optimizes for VTT's. check it out. Thank you Rondor! I might be able to get these maps put together in a high-resolution map pack. I'll also check out the AaW version, but they are a subscription service, not a one-shot payment. New review over at Game Knight Reviews! 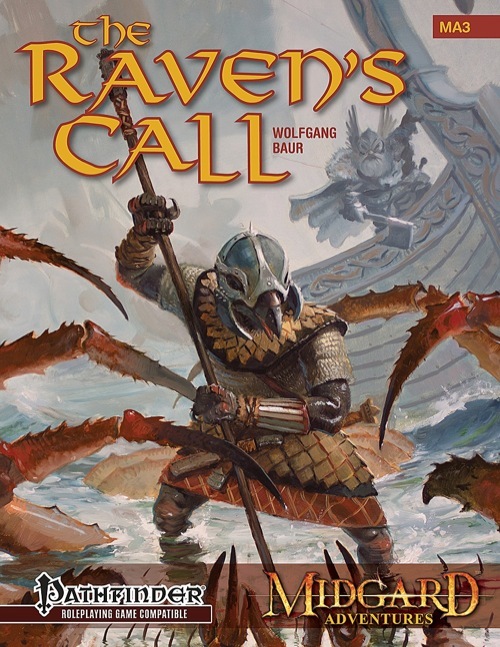 Where many low-level adventures fail to offer a ton of choices, sometimes railroading the PCs down a garden path – The Raven’s Call offers a wide range of choices. Plenty of hooks to get PCs involved and different ways to keep them not only interested, but busy once they arrive. Weighing in at 21 pages, with 17 pages of content and art on every other page, this PDF is chock full of possibilities for a Pathfinder campaign. What I really like is the flexibility of the adventure setup. The PCs can choose to go in with blades gleaming in the midday sun or use some stealth and even employ a bit of guardian magic to help encourage the bad guys to leave. But those choices lie firmly in the hands of the players. Will they play it smart or will they choose to be bold? Either way, things have the potential to go really well or horribly wrong. When or if the PCs succeed, there are even tips on what to do next. So if you’re looking for a great way to kick off a new campaign in Midgard, this is a terrific way to get one started. It’ll make your players think, which is something I think every GM is after to one degree or another. Hey guys, I just wanted to know about the trollkins stat block, in Raven's call they have 2 claws and fast healing 1, however in the Northlands they have neither of those. Should I give the baserace 2 claws and slap on fast healing 1 if they are of troll heritage? The Raven's Call stat block is more recent and offers more options; the Northlands one is slightly underpowered and was written before ARG. That said, trollkin are widely variable, and you should feel free to modify them more than a standard race for that reason. And note that the fast healing 1 is extremely limited in the final version of Raven's Call. Alright thanks, the limited fast healing is good...when travelling in the Northlands one should bring plenty of fire(both magical and alchemical). An actual-play review over at The Cool Ship, with quotes from the players who played it for the review! Most of the time, published adventures are not really my bag. I’m not a big fan of dungeon crawls, and I really hate being constrained by adventure modules that (in my experience) are pretty linear. When I create my own adventures, I try to keep them as open-ended as possible; you never know what kind of monkey wrench the players will throw in your plans, so having a less linear approach generally helps me come up with things on the fly. That’s why I was so surprised by The Raven’s Call! It wasn’t linear. In fact, it set up a fun sandbox for the players to adventure in and gave them multiple possible motivations to move things in the right direction. That's a great review! I also liked the player comments at the end. Nice one Wolfgang - with To the Edge of the World you are writing some great beginner adventures that don't leave the heroism in the cellar catching rats for questgivers. Reviewed first on Endzeitgeist.com, then submitted to Nerdtrek and GMS magazine and posted here and on OBS. Cheers! What level is the adventure for? Thanks, Marc! I'm sorry I didn't spot that in the blurb (which I have just re-read in a shame-faced fashion). Exactly where in the Northlands is this adventure set? I'd set it in Trollheim, but there's no reason it can't be anywhere else - its a thorp, really, and easily inserted anywhere. Is there any reason why this MA is in print and the others aren't? I saw on another thread that the races are hopefully going for a print compendium (like the classes) so I will be waiting for that. I have this one in print are the others going to go to print or maybe a compendium every so often or....? Page count is the main factor that made this the "let's see if people want them in print" experiment. Well, that and the art and maps seem stronger than some. It got a great reception in PDF, but not as much in print. So we won't do all the others in print, but a compilation book of, say, MA1 to 7 or something like that is not out of the question. At earliest, we're talking 2015. Wait a minute. The product description advertises the trollkin as a PC race, but the actual PDF only has a bestiary-esque stat block for them. Am I missing something? I'm having the exact same issue. What part of the 2d8 HD makes it a PC race? Also, the trollkin shamam 3 has only 4 HD. Where's the 5th? Or are trollkins only supposed to have 1? The product description is wrong. The trollkin PC race was planned, but we ran out of room, and it is not in the adventure. I've sent Liz a note, and put the trollkin on the list for a future update to this release. The 5th HD is missing. Awesome. Looking forward to the update. I know a couple of players who want to try out the race. Ordinary Javelins of Lightning are always consumed after their attack, but the above seems to imply that the mythic javelins in this adventure are only consumed on a critical hit, and could be re-used until a character scores a crit with one of these javelins. Is this the correct reading? Or have I mis-interpreted? Edit: Also, an excellent, challenging module based on an old - school premise and Norse flavor. I'm really looking forward to running this. Specific rules trump general rules, so yes, I consider your reading correct - at least that's how I handled it. So, I'd like to run this in the vicinity of Zobeck. Any suggestions for location? Is there a village near Zobeck that could be used for this adventure? Perhaps somewhere in Margrave? Yes, anywhere in the Margreve forest could be a reasonable location. You'd want to put it near a big river to replace the ocean, but trollkin raiders against a fishing/logging village on the outskirts of the forest definitely works. About what I was thinking :) Thanks!